The multivitamins and supplement industry is a multibillion dollar industry, with Americans spending approximately $36.1 billion in 2017 alone. However, despite the common perception of the health benefits of these supplements, a recent review published in Circulation: Cardiovascular Quality and Outcomes shows that they do not prevent heart disease. The researchers write that their review showed there was: “no association between MVM supplementation and risk of CVD, CHD, or stroke mortality. MVM supplements were associated with a slightly lower risk of CHD incidence in the overall analysis, but no association was found with stroke incidence.”  In other words, multivitamin and supplements don’t do what they say on the tin. An editorial, published in the same journal, states that as multivitamin supplements do not reduce CVD, they should not be taken for that purpose. However, it was suggested that these supplements may have been useful during times when people did not have access to the variety of fruits, vegetables and fortified foods that they enjoy today. This is something that we have explored previously on Cardio Debate , in particular regarding the Reduction of Cardiovascular Events with EPA–Intervention Trial (REDUCE-IT), and Statin Residual Risk Reduction with EpaNova in High Cardiovascular Risk Patients with Hypertriglyceridemia (STRENGTH) – which test high doses (4g) of fish oil supplements in patients with very high triglyceride levels and who are taking statins. These supplements were shown to reduce triglyceride levels, however as the study authors point out they have not been tested for heart attack, stroke or mortality. 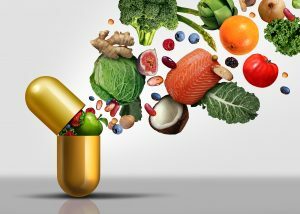 Therefore, it is clear that a healthy diet will help prevent CHD and CVD, and there is a body of research that suggests getting vitamins, minerals and other nutrients directly from food is more beneficial than ingesting in pill form. Perhaps the emphasis should be on eating the right foods rather than taking the right supplements?